The flat (1F) Fillet Position is performed where the filler weld is rotated so that the filler material will be level with the ground. This is the easiest position and will only qualify you for the flat position. 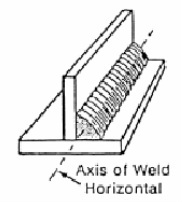 The 2F (Horizontal) Fillet Position is Performed where the fillet weld is rotated so that filler material will be horizontal to the ground. This position is a little harder then the 1F position and normally will qualify you also in the 1F position to. The 3F (Vertical) Fillet Position is Performed where the fillet weld is rotated so that filler material will be vertical to the ground. 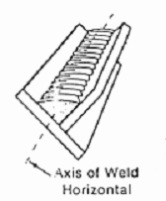 The progression of the weld is normally performed up-hill. This position is harder to perform then 1F or 2F but normally only qualifies you in the Vertical position and the Flat Position.